Mushrise Park (was formerly known as Mushrise Fields under the Pi'illo Kingdom era) is a grassland area found in Mario & Luigi: Dream Team. As the name suggests, it is a local park just south of Pi'illo Castle. Its name is a portmanteau of "mushroom" and "sunrise". Mario and Luigi come to the park to free Eldream, a Pi'illo elder who knows how to reach Dream's Deep where Princess Peach is being held captive by Antasma. They meet up with Brickle, the Manager of the park, who reveals he has Eldream but refuses to give it up unless Mario & Luigi can catch him. After discovering their hammers, they find Brickle stuck on top of a fountain, scared to jump off. The Bros. immediately go underground and raise the water pressure, spraying Brickle off the fountain and causing the fountain itself to explode. In the meanwhile, at Brickle's Maintenance hut, a piece of the fountain ends up hitting Grobot, the park's hydrozation robot, damaging it and making it go on a frenzy. During that time, Brickle thanks the Mario Bros. for getting him down and gives them the Eldream Pillow, saying they can use it on his bed inside his hut. Unfortunately, Grobot has gone absolutely berserk at this point and attacks Brickle, forcing the Bros. to fight Grobot. The Bros. beat the haywire robot and it gets destroyed, leaving Brickle heartbroken yet he gets over it quickly and allows the Bros. to use the Eldream pillow. Inside the Dream World, in Dreamy Mushrise Park, Mario and Dreamy Luigi encounter Dreambunny, Eldream's pet rabbit, who has the nightmare chunk containing Eldream. Before they can go on a full pursue, Dreamy Brickle appears trying to catch the rabbit as well, thinking it'll be what will attract people to his park. The Bros. and Brickle run after the rabbit (with Brickle, seen wearing bunny ears, attempting to lure it with a carrot), but they eventually decide to call it a truce and the Bros. catch the rabbit, who gives up the Nightmare Chunk containing Eldream. Eldream is set free and opens a portal to the Dream Deep, where they corner Antasma (but are kept back but his screeching). Meanwhile, in the real world, Starlow encounters Kamek, Private Goomp, Corporal Paraplonk, Sergeant Guy, with the latter three being promoted to royal guard. Not long after, Bowser appears, and, after demanding the location of Peach, picks up her scent, and jumps into the Dream Portal. He ends up in Dream Deep where the Mario Bros. are with Antasma and Peach. Bowser shows dislike to Antasma (who is currently in bat form) at first for stealing Peach instead of him, but after Antasma convinces that he can give Bowser new moves and all, the two form a team that the Bros. battle. The two get defeated, and Antasma increases the power inside Bowser, as well as flooring the Bros. and Peach. 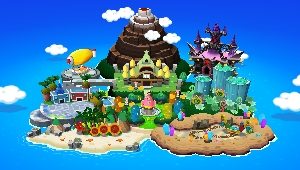 Bowser and Antasma leave the portal and say they have work to do and are too busy to kidnap Peach, and Eldream pulls the other three back into the Real World. Everyone learns that Antasma is after the Dream Stone, which resides in Dozing Sands. Thus the Bros. leave the park to go and find the Dream Stone. Later on during the Bros.' hunt for the Zee Parts, Brickle is found by the broken fountain, seemingly troubled by the sheer mass of rocks in areas of the park. 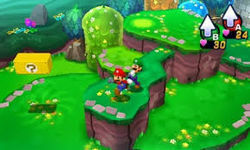 Upon spotting Mario and Luigi and being asked if he's seen the Mushrise Tree Board anywhere in the park, he reveals that he has it in his hands at the moment, but only agrees to give them information as long as they smash some rocks throughout the park. Upon the Bros.' quick success at this, they return to a pleased Brickle and follow him through the Maintenance Hut and into an area that was not previously accessible due to a Brock standing guard. Brickle stops before a large wooden chair-like stump, where what is soon proven to be the Mushrise Tree Board sits. Once it's confirmed to be the Mushrise Tree Board, Brickle then returns to work, and the Bros. continue the hunt for the Zee Parts. This page was last edited on February 8, 2018, at 19:22.